Last week, we took a delivery of a new Samsung Galaxy SII handset and although we were delighted with the silky smooth operation and the overall performance, our joy was slightly marred when we spotted a small circle on the screen. Best described as the kind of mark a small cup of tea might make (! ), it’s only visible against dark to mid-tone colours and doesn’t appear at all on pure black or white screens. Despite thoroughly trawling the web for information, it looks like this issue is comparatively very rare indeed as we could barely find anyone suffering the same problem (and the Galaxy S2 has already shifted millions of units). One of our readers pointed out that others have reported that the mark was created by the suction cup used on the assembly line. This is supposed to fade over time, but if that is happening then it’s too slow a process for us to notice over a weekend. To be on the safe side, we wrote to Amazon (the people we bought the phone from) to point out the issue. They immediately wrote back and said that a replacement was on its way, so kudos to them for such a swift response. Disappointingly, we’re still to get answer from our email to Samsung, but we’ll post up as soon as we hear anything – and report back on how our replacement fares. Update: we’re happy to report that the Samsung S2 replacement appears to have no issues at all, and the screen is just fine. Huzzah! We have to give Amazon due credit here. We emailed then yesterday afternoon and the replacement arrived this morning. We’re charging it up now, and hopefully this one will be OK. Stay tuned! I got the exact same thing (the Netherlands). However, I sent it to the repair center and they send it back to me without any replacement saying its correctly working (stupid people). I immediately sent it back again, so hope it will be replaced. 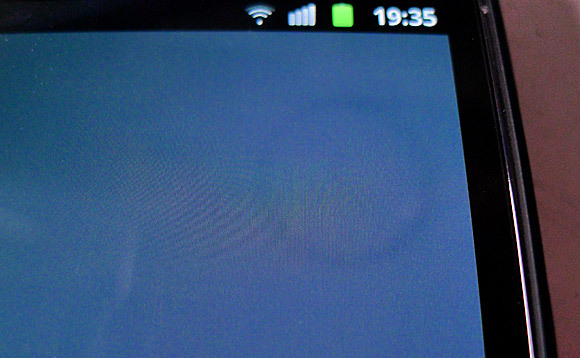 Also, my home-button has backlight leaking and isn’t placed correctly. 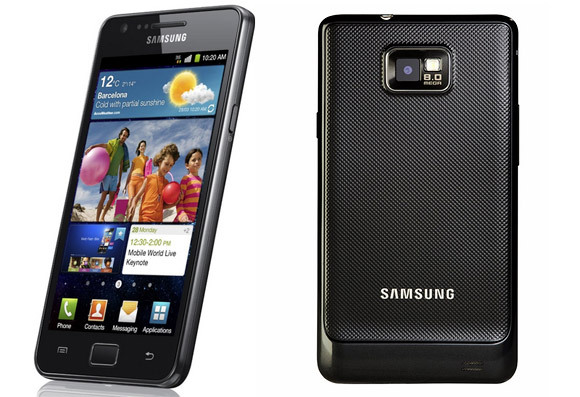 Am I the only Samsung user that does not know where to get a users manual for my new Galaxy SII phone? The issue regarding the small blue circle: I had read that some users did experience another problem with regards to the screen: they experienced some slight fade on the left side of the screen and that too under certain colors and the screen being at the min brightness…. I have got same issues on different place at the screen. some cloud, looks like a very small circle. and there were some lines (like graphic card problem on pc) appeared and the phone locked. I recently purchased this phone on 15th June from Allahabad India at 31K INR..
After using it for 1 week i detected this issue in my Samsung Galaxy s2.. a black circular spot on the screen .. i searched the web and found this article.. thank god i’m not the only one having this issue.. Waiting for samsung to replace my handset .. already given my samsung galaxy s2 to local service center.. Thanks for this article .. It cleared my doubts regarding this issue..
mine have the same mark too. only it’s on the left side. i call samsung malaysia hotline & they told me to send it to nearest samsung service centre to be inspected. but i haven’t do so. if i do, will i get a replacement or they will just repair my phone (eg. replace the screen)? ITS THE SUN!!!!!!!!!!!!!!!!!! IT IS A CIRCLE AND HAS AN ORANGE TINT, AND IS IN EXACTLY THE SAME PLACE AND TURNS ORANGE WHEN THE SUNS OUT. SILLY SAUSAGES. !!!!!!!!!!!!!!!!!!!!!!!! !